This article was originally published on Pat Shaughnessy’s blog. 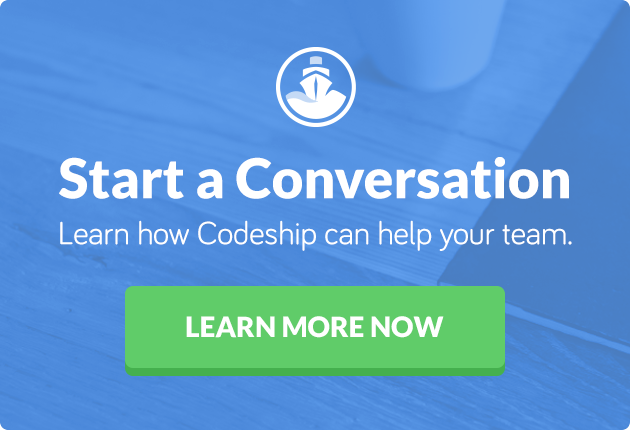 Pat kindly gave permission to let us share it here for Codeship readers. job in the Summer of 1986 looked just like this. Recently I have been spending some of my free time studying Clojure and Haskell. I’ve been learning how a program built with a series of small, pure functions can be very robust and maintainable. However, I don’t want to give up on Ruby. I want to keep the expressiveness, beauty and readability of Ruby, while writing simple functions with no side effects. But how can this be possible? Unlike functional languages, Ruby encourages you to hide state inside of objects and to write functions (methods) that have side effects, modifying an instance variable, for example. Isn’t using an object oriented language like Ruby, Python, or Java a decision to abandon the benefits of functional programming? No. In fact, a couple of weeks ago Ruby’s object model helped me refactor one confusing function into a series of small simple ones. Today I’ll show you what happened: how using a Ruby class helped me write more functional code. This is simple enough to understand and works fine. parse1 is small function; if you remove the calls to puts it only contains three lines of code, two simple calls to split. How could this be any simpler? Next you decide to look for a more functional solution by asking Ruby for what you want, instead of telling it what to do. You try to break the problem up into small functions that return what you need. But what functions should you write? What values should they return? 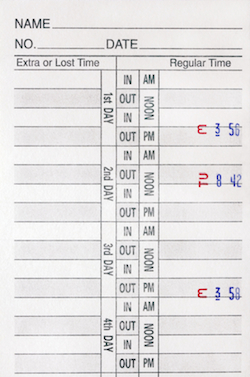 In this simple example, the answer is obvious: You can write a function to parse each value in the timesheet data. You have divided the problem up into small pieces. Each function will return a predictable value based on some input and doesn’t have any side effects. These will be pure functions: They will always return the same result given the same arguments. You know that if you pass a line from my timesheet, last_name will always return “Shaughnessy.” You’ve turned the problem around; you’ve phrased the problem as a series of questions rather than as a list of instructions. As a Certified ScrumMaster™, you believe in TDD and other extreme programming practices. Originally, while writing parse1 above, it didn’t even occur to you to write tests (and if it had, it would have been very difficult). However, now after breaking the problem up into a series of functions, it seems natural to write tests for them. Because the functions are small, the tests are small. Because the tests are small, you actually take the time to write them. Because the functions are decoupled from each other, it’s easy for you to decide which tests to write. To your surprise, you actually find a bug! You’re happy with your new tests. Ruby allowed you describe the behavior of the functions in a very natural, readable way. Ruby at its best. As an added bonus, the tests now also pass! This is clean and easy to follow, but now you have a performance bug: Each time around the loop, your code passes the same line to employee_id, office, and last_name. Now Ruby will call the values function over and over again. This is unnecessary and needless; in fact, our original parse1 code didn’t have this problem. By introducing functions, we have slowed down our code. However, because these are simple, pure functions, you know they will always return the same value given the same input argument, the same line of text in this example. This means theoretically you can avoid calling split over and over again by caching the results. This looks straightforward: The keys in split_lines are the lines, and the values are the corresponding split lines. You use Ruby’s elegant ||= operator either to return a cached value from the hash or actually call split, updating the hash. The only problem with this is that it doesn’t work. The code inside of the values function can’t access the split_lines hash, located outside the method. And if you move split_lines inside of values, it would become a local variable and not retain values across method calls. This confusing Ruby syntax allows the code inside of the new values method to access the surrounding scope, including the hash table. However, taking a step back, something about your program now feels wrong. Instead of making your code simpler and easier to understand, functional programming has started to make your Ruby code more confusing and harder to read. You’ve introduced a new data structure to cache results and resorted to confusing metaprogramming to make it work. And your functions are still quite repetitive. What’s gone wrong? Possibly Ruby isn’t the right language to use with functional programming. Now you have a lot less noise. The biggest improvement is that now there’s no need to pass the line of text around as a parameter to each function. Instead, you hide it away in an instance variable, making the code much easier to read. Also, your functions have become methods. Now you know all the functions related to parsing lines are in the Line class. You know where to find them and more or less what they are for. Ruby has helped you organize your code using a class, which is really just a collection of functions. Now each instance of the Line class, each line of text you program uses, will have its own copy of @values. By using a Ruby class, you don’t need to resort to a hash table to map between lines (keys) and split lines (values). Instead you employ a very common Ruby idiom, combining an instance variable @values, with the ||= operator. Instance variables are the perfect place to cache information such as method return values. Now your code is much easier to read. Using an object oriented instead of a functional design turned out to be a good idea. With your object oriented solution, you have broken some of the most important rules of functional programming: First, you created hidden state, the @line instance variable, wrapping it up and hiding it inside the Line class. The @values instance variable holds even more state information. And second, the initialize and values methods have side effects: They change the value of @line and @values. Finally, all the other methods of Line are no longer pure functions! They return values that depend on state located outside of each function: the @line variable. In fact, they can return different values even though they take no arguments at all. But I believe these are technicalities. You haven’t lost the benefits of functional programming with this refactoring. While the methods of Line depend on external state (@line and @values), that state isn’t located very far away. It’s still easy to predict, understand, and test what these small functions do. Also, while @line is technically a mutable string that you change in your program, in practice it isn’t. You set it once using initialize and then never change it again. While you may update @values each time values is called, it’s just a performance optimization. It doesn’t change the overall behavior of values. You’ve broken the rules and rewritten your pure, functional program in a more idiomatic, Ruby manner. However, you haven’t lost the spirit of functional programming. Your code is just as easy to understand, maintain, and test. You’ve broken the rules and rewritten your functional program in a more idiomatic, Ruby manner. Of course, there’s not much difference here. You simply added a line of code to create new line objects and then called its methods instead of your original functions. Again, not much difference in the code. However, the way you think about your program has changed dramatically. Now your code implements a pipeline of sorts, passing data through a series of operations or transformations. You start with an array of text lines from a file, convert them into an array of Ruby objects, and finally process each object using your parse functions. This pattern of passing data through a series of operations is common in languages such as Haskell and Clojure. What’s interesting here is how Ruby objects are the perfect target for these operations. You’ve used a Ruby class to implement a functional programming pattern. Update: Oren Dobzinski suggested adding a to_s method to Line, which would allow us to push the object pipeline idea even further. Thanks Oren! See Dave Thomas’s article “Telling, Asking, and the Power of Jargon” for more background on “Tell, Don’t Ask”.